Taken with Olympus E500 digital camera January 1st 2009. Click image for larger view. Here I have photographed a Red Banded Polypore mushroom (Fomitopsis pinicola) growing on a dead Norway spruce trunk. 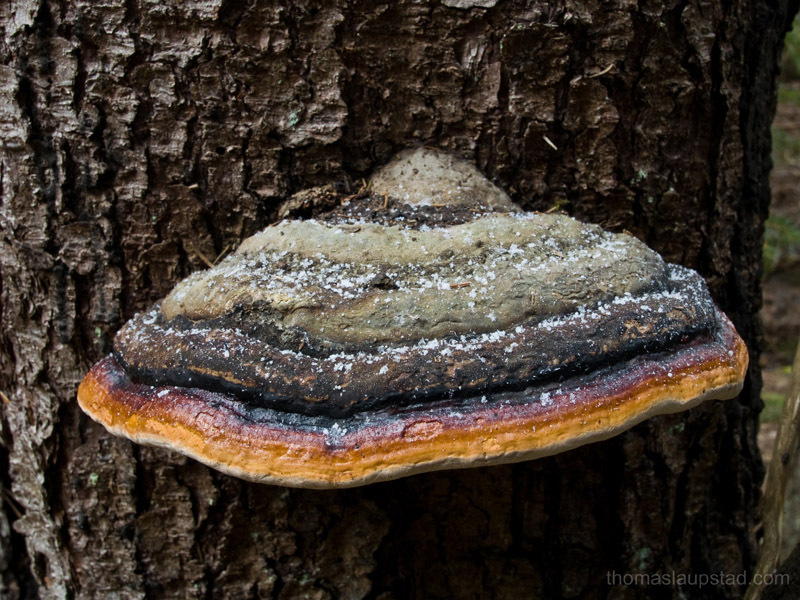 The colored bands around the mushroom made me stop and take a better look. The bands are really beautiful, aren’t they? Also notice the white snow crystals on top of the mushroom. It was pretty darn cold! The Red Banded Polypore is a common polypore mushroom in the temperate Northern hemisphere. These kind of mushrooms are often found on rotting lodges and they have a distinctive look. Check out this photo to see the whole tree that were broken in two. You can also check out my other mushroom pictures here. Thomas: I also am photographing similiar mushrooms. Trying to get to know my new FL-50R flash…. Nice colorful picture of a mushroom, as you say very nice band of colors. That’s a great photo, nice colours. Beautiful! Its like a rainbow! Ciao! What a incredible mushroom, the red band is really beautiful! That is stunning, I have never seen a mushroom with any other colour than brown in it. It must have been chilly at the time but the icicles on the top just give it more character. Really love the details and colours! Unique close up shot. Caught a fantastic shot there with the ice on top.